Not being a connoisseur of art as such, I know little of artists and art critics. All my life, my only affinity to art has been a vague and clearly sparse familiarity with names. As a child I knew the names of the Europeans and those of the 1943 Group. I knew Stanley Kirinde more intimately, not as an artist, but as a friend of the family who would quickly sketch pictures in books that had caught the fancy of us children. In the university, I had friends who talked of Shantha K. Herrath, some even in reverential terms. Especially those who liked art. It was then that I began to "see" him in the Divaina. Perhaps because we dont have a culture where ordinary people are encouraged to study or appreciate art, we tend to be blind to newspaper art and even if we do pause awhile, the chances are that we will miss the name of the artist. In any case, I was at that age when the political cartoon was the only "illustration" that caught the eye. How could we not know Wijesoma, then? Looking back, I sometimes ask myself, "how could I have missed Shantha K. Herrath?" It is always interesting to meet people youve read or heard about. It is even more interesting to work with them, get to know them and see them not as legends, but as ordinary people who have extraordinary talent but nevertheless do not let this fact weigh down conversation or the general interaction with people. So it was with Shantha K. Herrath. Two years is not enough to read a man. And yet, there are many things that I could tell about Shantha, especially about the human character that lives within and outside his creative work. But then again, this is not a biographical sketch of the man. It is not a personal note, but a short piece on how Shantha views art and his professional work, written against the backdrop of a book launch and an exhibition. Shantha will be holding an exhibition of "Newspaper Art" at the Library Services Board Auditorium from 16-18 January. The opening of the exhibition at 3.00 pm on that day will coincide with the launching of his book, "A Collection of Pocket Cartoons". The book is not just a selection of Shanthas pocket cartoons that have adorned the first page of the Divaina over the past decade and a half. It contains a history of the political cartoon as well as sketches of the more prominent cartoonists of the country. It is therefore a book that caters to both the political alert as well as the student of art and art history. The exhibition itself is a first in that never before has "newspaper art", as a genre, been exhibited in this manner. Although one could say "newspapers, and therefore newspaper art, is exhibited every day," there is a difference. One, we have got used to think that "reading" refers to running the eye over a string of words. "Art" has to come in frames and intended to hang on walls. On the other hand, newspapers have not been bypassed by the development of visual media. A word is also a picture, a page of a newspaper is a visual. This is why there are "layout artists" now. The TV generation demands something visually pleasing as a precondition for "agreeing" to peruse the content. This is why Shanthas exhibition is different and indeed important, for it seeks to educate both the reading public and all those who involved in the media, including those who wish to pursue a career in journalism. Shantha claims that if one doesnt have even the most basic understanding, it is impossible to appreciate art or to associate with it. There is very little in our society to change this situation. "One cannot really be happy with the space for art, considering that there are only a few galleries even in Colombo. This exhibition is but an effort to share the experiences I have gathered in over 20 years of professional work with the public." This is what Shantha has to say about the exhibition. "Newspapers are often read and then cast away. The worth of a newspaper is then measured by the bothal kaaraya. Can the worth of this art be weighed in terms of kilograms? Is the art of producing a newspaper really, art? What we are discussing through this exhibition is the art that is embedded in the art of bringing out a newspaper. Earlier, it was heavy art that adorned the walls of art galleries. Today, we are hanging on these same walls, some of the creative art found in newspapers. Is there anything in this art that qualifies it to hang on the walls of an art gallery? Take a look!" What does Shantha have to say about art in general? We asked. "As far as I am concerned, I am still learning. This exhibition is a part of my education." 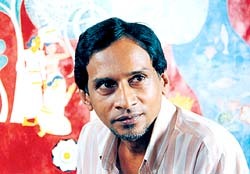 In his first exhibition Shantha had concentrated on paintings. Thereafter, he had moved on the sculpture portraits, tracings of temple paintings, prints and illustrations. 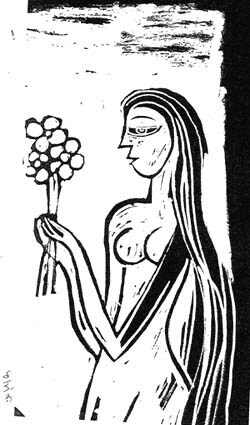 Very early in his career Shantha had realised that there are many fields within "art". "There is applied art, visual art, commercial art, graphics, cartoons etc. They can be differentiated from one another in terms of the intended audience, the medium used, the purpose, the style and so on. What is emphasises in one form can be totally ignored in another." Shantha has been working at Upali Newspapers Ltd. for around twenty years now. He has drawn cartoons, illustrated articles and short stories, experimented with various the layout and probably a hundred and one other things too. Perhaps, I am being biased towards a colleague and a friend, but I cant help thinking that there is something distinct about Shanthas work, something that separates it from that which is freely found in other newspapers. So I asked him to explain. "This is something others have to judge. I am in the newspaper world. I am not a person who is content to work within the conventional limitations of a newspaper. I strive to extend these limits. I believe this is how I can contribute to and nourish my profession." Shantha is a perfectionist. Striving for perfection is, I believe, the hallmark of any serious artist. This probably means that it is not easy to work with him. But then again, anyone who is serious about his/her work ought to realise that this is a price worth paying. A perfectionist he may be, but Shantha has never struck me as an arrogant person. He is a lifelong researcher, constantly keeping himself updated about both his profession and things related to art. "I have to admit that I am not satisfied with my work. So, whenever I have the time, I go in search of what is new in the world of art. I engage with the subject, and make an effort to appreciate these things. It is not important to me if any work of art is "better" or "worse", indeed whether it really qualifies for the label art or not. But whatever it is that I take away, the feelings that they evoke in me, I work into my creations." Like most people who are endowed with exceptional talent, Shantha is a teacher. He is ever generous when it comes to sharing what he knows, even with people who know next to nothing of art, such as I. And not just about art. A deeply religious man, in whose work there is an unmistakable trace of his long engagement with Buddhism, Shantha is often philosophical and in my experience of the man, tends to treat the ups and downs of his life with equanimity. Sometimes I even wonder what Shantha is doing stuck in a newspaper, given his extraordinary talent. "He could make more lasting contributions to our sensibilities if he became a full time artist," I often tell myself. Then again, he is a colleague on whom I depend much. This is not about how I see Shantha, I have to remind myself. It should be about his work, and that I am not competent to do. I take refuge in the easy out, "Let his work speak for itself."